It used to be my Sunday ritual: wake up early to play 30-and-over Huff-n-Puff soccer—a gringo on a mostly Mexican team—then slowly sidle into the afternoon eating carne asada, drinking Tecates and telling exaggerated accounts of in-game exploits. While the tales should have revolved around age and treachery prevailing over youth and skill, they never did. But the carne asada was really good. The term “carne asada” means different things in different contexts. At one level it means “backyard barbecue”—a social event. At the most basic level the term means “roasted meat,” and not necessarily beef. When it refers to a dish, however, “carne asada” is beef—usually a tough, flavorful cut such as skirt, flank or flap steak—marinated in a lime-based concoction, sliced thin and grilled over mesquite wood or charcoal. It’s often served with guacamole, beans, grilled onions and salsas, and used as a taco filling. Nearly ubiquitous in Northern Mexico and Southern California, it’s not something you would find in Mexico City. The best carne asada tacqueria I’ve found is Tacos El Yaqui in Rosarito (115 Calle Mar del Norte). The stand, founded by Felipe N?Òez, a Yaqui Indian from Zacatecas in Northern Mexico, has been there since 1984. Núñez settled in Rosarito after deciding that making his “fortune” in the United States (and remitting much of it back home) was not the life he wanted. The menu at Yaqui is very short. It’s basically tacos perrones, carne asada tacos with cheese. Oh, you can order a quesadilla, but why would you? Indeed, the signature perrones were created as, essentially, a stuffed quesadilla: flour tortillas filled with cheese and cooked briefly on the flat top before being filled with guacamole, pinto beans, chopped white onion, fresh cilantro, a bit of salsa and carne asada. The two keys to the perrones are the use of Sonoran arrachera and the fact they’re grilled over mesquite wood. Arrachera is the Mexican cut of skirt (or hanger) steak, the highest grade in use for carne asada in Mexico. Instead of grilling over charcoal, Yaqui grills the meat over mesquite wood, adding another layer of flavor. Another special touch here is that the tacos perrones are served with grilled jalapeño chile peppers rather than the more common pico de gallo or other salsas. The grilling rounds out the flavor of the jalapeños (which do remain spicy). When added to the taco, the grilled jalapeños mingle with the juices from the meat and guacamole to, essentially, create a salsa right there in your hand. There’s something in the combination of all these ingredients that makes the whole greater than the sum of the parts. Truth be told, I do miss playing soccer. 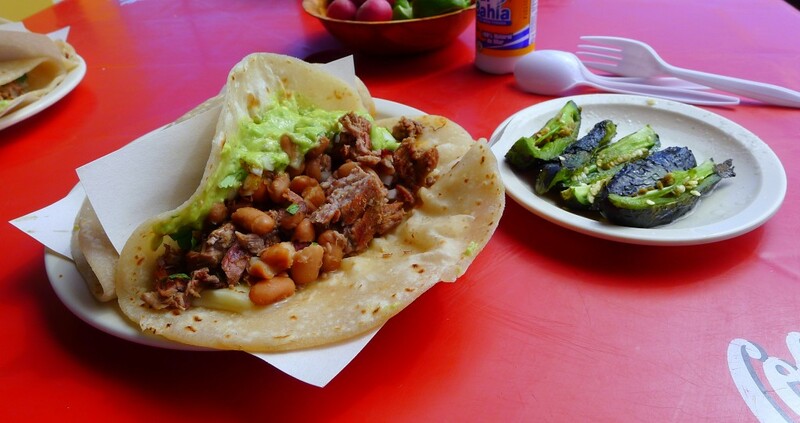 But I miss the carne asada more.